Pen and ink and wash drawing by Ben. D. Herold (fl. c.1845) of the Nagarkhana or northern gateway to the old palace at Kolhapur in Maharashtra, dated January 1845. This view shows elephants in chambers on either side of the central gateway. The image is laid down on card and is signed at the lower right 'Ben.D. Herold Jany. 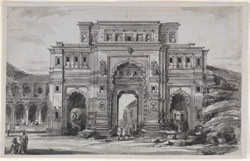 1845', and inscribed in ink on the reverse: 'Entrance to the Palace, Kolapore, Bombay Presidency. B.D. Herold, 14th Lt. Dragoons delt. Jany. 1845.' During the minority of the Raja of Kolhapur, Shivaji IV (1837-66), a revolt against the ruling house by various armed insurgents led to the British takeover in 1844. According to the Kolhapur District Gazetteer (Bombay, 1960), pp. 878-7, "The Nagarkhana building is ... perhaps the tallest building in the city and from its top one gets a panoramic view of the city. It is a massive five-storeyed building built mainly in black stone. ... On the third storey there is a chamber with square pillars. The pillars as well as the walls are of highly polished black stone. It is called Aine Mahal or the hall of mirrors because the surface of the walls and of the pillars is so highly polished that it reflects images. The main gate of the nagarkhana has big arches. On either side of the gate, there is a room where elephants were formerly kept. The nagarkhana was built by Buvasaheb Maharaj, the ruler of Kolhapur between 1828 and 1838."